Container Ramps | Dock Door Systems Inc. It allows you to safely navigate the transition from ground to the bed of the shipping container. Bluff Container Ramps are built tough to withstand heavy use. They are built to last. 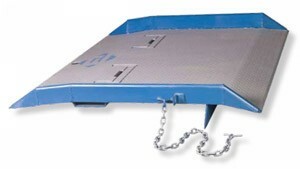 Shipping Container Ramps are available in 15K, 20K, 25K, and 30K capacities. Other sizes available.